Editor's Pick: Fee Solution - Cost-Plus AMC Model? The cost-plus or “full fee” AMC model, where the appraiser receives the full fee for the appraisal and the lender/mortgage broker pays the AMC an additional fee for its services, has been posed as a workable solution ever since HVCC made AMCs a fact of life for most appraisers. 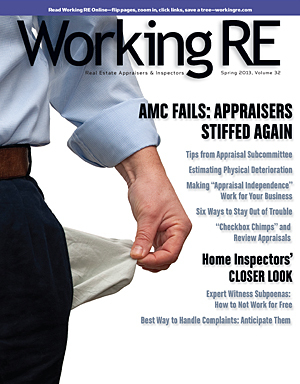 Editor’s Note: Some appraisers are being paid full fees for their appraisal work, even though the orders are coming from AMCs. Here’s how it works. First published in Working RE print, Volume 31. Editor's Pick: Low Fee Solution - Cost-Plus AMC Model? Some appraisers are being paid full fees for their appraisal work, even though the orders are coming from appraisal management companies (AMCs). Here’s how it works. It’s called the cost-plus AMC fee model. The cost-plus or “full fee” AMC model, where the appraiser receives the full fee for the appraisal and the lender/mortgage broker pays the AMC an additional fee for its services, has been posed as a workable solution ever since the Home Valuation Code of Conduct (HVCC) made AMCs a fact of life for most appraisers. Now it appears that some lenders and mortgage brokers are beginning to see the quality advantages of the cost-plus model. Bill Streep, an appraiser from San Antonio, Texas, says that he has been working for AMCs on the cost-plus model for over two years. “At first I just had one client who was paying me full-fees; now I have four or five clients who are paying me on a cost-plus model through an AMC—some are correspondent lenders, some are traditional lenders or mortgage brokers,” says Streep. Streep says that he receives significantly higher fees from his clients using the cost-plus model. He describes a winnowing process over the last few years- picking and choosing who to work for until the majority are full fee clients. “I turn down orders all the time and refuse to work for low fees. Maybe it’s the quality of my work, maybe it’s the local environment, maybe it’s both,” says Streep. He says his sales and marketing background also are a factor- he promotes his services every chance he gets. This, plus good word of mouth referrals earned by producing consistently high-quality work, has helped him arrive at a place where he only works for full fees- mostly in this cost-plus model. Streep says lenders are adopting the model because they want a quality appraiser panel. “This model works for all parties: appraisers get paid a fair fee, lenders get the quality they want and AMCs get paid for their role. When you pay someone a fair fee, you get a good product. You do get what you pay for,” Streep says. Chuck Mureddu, the Managing Director at Quality Valuation Services (QVS), a national, appraiser-owned AMC, says that QVS is currently working with lenders who have recently begun using a cost-plus model. In contrast to the model described by Streep, Mureddu says that at QVS the lender does not select the appraiser panel. “We use our own panel. We don’t believe in utilizing a lender’s panel because there’s a risk of diluting the independence part of building a fee panel. We’re not opposed to adding appraisers recommended by our clients, but we vet all appraisers to determine competency before adding them to our panel,” Mureddu says. Mureddu sees the cost-plus model as one that benefits both the AMC and the appraiser. “Our appraisers are very happy about it. It benefits them because they get paid a full fee and are able to spend more time and do a better job. Cost-plus also allows us to pay higher fees and go out and hire competent appraisers, which increases the value we offer to our clients and makes us more competitive,” Mureddu says. Even outside the cost-plus model, Mureddu stresses the importance of paying appraisers fair fees and highlights how the appraiser fee is related to the quality of work. “Appraisal fees have been pretty stagnant over the last 20 years. But when AMCs came onto the scene, some, not all, ended up taking a significant portion of the appraisal fee. The result is that only those appraisers who are incompetent or new to the game will work for those lower fees, so the quality of the appraisal is reduced,” Mureddu says. Another effect, according to Mureddu, is that low fees have pushed many good appraisers out of the business. Consequently, the cost-plus model, and higher fees in general, are, in part, a response to the effects that low fees have had on appraisal quality. Mureddu feels strongly that appraisers must be paid fair fees. “We look at appraisers as our business partners and feel that ‘faster and cheaper’ is the wrong approach. 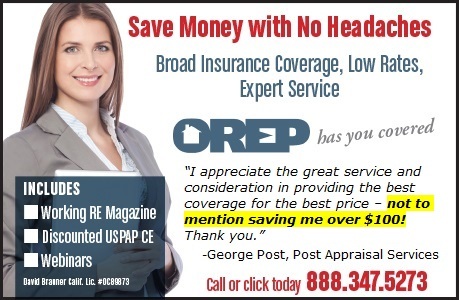 Higher fees help capture the best and the brightest appraisers. We don’t want form-fillers—it costs us money to deal with form-fillers. We want good appraisers,” Mureddu says. Some lenders express concern about the problems that might arise if they misjudge the complexity of the assignment and the appraiser requests a fee increase. The Real Estate Settlement Procedures Act (RESPA) requires a Good Faith Estimate that must be disclosed to the borrower, which typically leads to a lender disclosing the appraisal fee 7-10 days before the appraisal is even ordered. Since there is minimal tolerance for over-disclosure or under-disclosure, some lenders are hesitant about the problems that might arise when the fees to the appraiser and AMC are separated, and the appraiser then requests a fee increase. Mureddu says this typically is not a problem for QVS. “The lender has usually already done their homework and due diligence on the property, and through their direct engagement business, they know what a reasonable fee for the assignment is,” Mureddu says. However, Mureddu admits that the problem does arise. “There are going to be certain situations where the property is that white elephant, if you will. Sometimes we go back to the lender and say, look, this property is complex, and many times the bank will pay those higher fees to us. However in some cases, we will eat those extra costs,” Mureddu says. ATTENTION: You are receiving WRE Online News because you opted in at WorkingRE.com or purchased E&O insurance from OREP. WRE Online News Edition provides news-oriented content twice a month. The content for WRE Special Offer Editions is provided by paid sponsors. If you no longer wish to receive these emails from Working RE, please use the link found at the bottom of this newsletter to be removed from our mailing list.